Amongst all the greatest playwrights of the 20th century, Arthur Miller might be remembered as the most emotional writer of an unemotional milieu. Let’s put aside his repetitive discourse on inhuman capitalism, his stubborn or one-dimensional characters and his shallow and uninventive dialogues; only then we’ll be able to appreciate the emotional outpouring of opposite personalities or social forces: father and son, wife and husband, boss and employee, brother and brother. Should I now remark that Miller is one of the most crafted playwrights in the history of theatre? His works flow with an easiness that in the hands of skilful actors move spectators to tears. This judgment is corroborated by what Miller said in an interview before his death. In spite of his bet to succeed with Death of a Salesman or to quit playwriting, he believed that if celebrity had not come so early to his life he could have written far better plays. Ionesco was right when he attacked Miller as a bourgeois playwright, for the universe of Willy Loman is artificially contrived, and the spectator knows that he could have avoided it with a little bit of touch. Robert Falls' Death of a Salesman has proved to be one the most remarkable theatrical experiences at the West End this year. 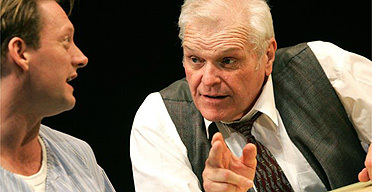 An anguishing Brian Dennehy, a compassionate Clare Higgins, a selfish Mark Bazeley and a confused Douglas Henshall stir intimate and secret emotions in a stifling familiar space. The abysm that Willy Loman has slowly prepared before his death becomes darker and deeper as Clare Higgins delivers her final words. The curtain fells and we leave the theatre with a bitter taste of impotence and despair. Theatre reviewers are most faithful to their profession when they comment on a classical play, such as Don Carlos, Hamlet or The Dog in the Manger. But when they face the task of writing on contemporary plays such as Amajuba (Like Doves We Rise), they get caught in the quagmire of literary criticism. Instead of analysing the actors' performance or the directors' resourcefulness, they discuss the merits and flaws of a literary text. As a result their reviews become unclear and uncompromising. Over all, they are unable to make justice to both an exceptional performance and a shallow text. As a screenplay, Yael Farber's Amajuba is nothing more than a melodrama of hungry kids, juvenile prostitutes, mistreated children, lonely immigrants and suffering soldiers. The story line, which had it happened in any European country would have been deemed improbable, is reluctantly accepted by readers and spectators of the most prosperous nations of the world. Two firm believes sustain this incongruity: first, the text is presented as a biographical confession; second, it happens in a third-world country. Anyone dismissing the text will expose him/herself to be accused of political incorrectness and/or third-world insensibility. The final warning that one of the characters utters to the audience: "I don't want your pity" comes too late, in a moment in which the audience can only feel compassion for his trials. Amajuba is a play that declines to explore the political, social and economic circumstances that determine the lives of its characters. It also fails to present an account of the factors that allow them to go on with their lives in spite of their suffering. Amajuba can be also read as a text that stretches the naive presumptions on underdeveloped societies spread by NGOs and third-world writers in Europe and the US. The faces of starving children are not more compelling than the scenes of this play. Yael Farber's staging of her own play, however, is exceptionally imaginative and resourceful. The final scene, in which actors and audience are melted in a cloud of dust is akin to a religious rite. Five actors perform for ninety minutes a text that under normal circumstances would have required of at least 15 actors. Such tour de force, which demands the utmost psychological and physical disposition of the actors, and which I can only compare to the efforts of the members of Le Cirque Du Soleil, has deservedly granted Yale Farber and her cast standing ovations from all around the world. Angus Jackson’s staging of Elmina’s Kitchen will be remembered not only for its fine blend of comedy and drama, but also for the outstanding performance of Oscar James as Baygee. Several theatre reviewers have unveiled the main deficiency of Elmina's Kitchen in its overcharged and scarcely believable plot. Notwithstanding, Kwame Kwei-Armah’s Opera Prima is a coherent and well-structured drama, as much influenced by contemporary theatre as by mainstream filmmaking. Spectators are constantly enticed by Deli, a man who wants to do the right thing as administrator of the West-Indian restaurant that he has inherited from his mother. 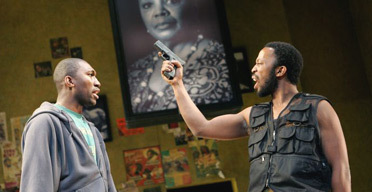 Kwame Kwei-Armah interprets Deli as a hero, his naivety shining over the crudity of his incarcerated brother, his lustful father, his violent friend and his capricious son. Deli even appears ready to sacrifice his own future for that of his offspring. Anguns Jackson does not stage the struggle of generations as a metaphor, but as a fact. The father punishes a son and the son punishes his father in a vicious circle curtailed by blood and death. Emmanuel Idowu interprets Ashley as a teenager with no allegiance to his family, his countenance being but a mask of continuous anxiety and exasperation. In spite of his technical mastery of playwriting, Kwame Kwei-Armah is unable to escape from the dominant discourse of Hollywood screenwriting. All the characters of Elmina’s Kitchen are guiltless and ambitious, from Anastasia, the woman who attempts to seduce Deli on account of his would-be bag of money, to Deli’s father, a man impoverished by lechery and drinking. Money gradually becomes the main character of a story of betrayal and deceit. Even Deli’s heroism vanishes towards the end of the play, when we see him coming out of his kitchen with a bag of money - the fruit of his deceased brother‘s crimes. Faithful to his roots, Kwame Kwei-Armah romanticises partying, a concession that adds a sociological value to his portrait of West-Indians in London. Most of the characters of Elmina’s Kitchen are not as afraid of pain as of relinquishing their sensuous pleasures. Spectators will be surely taken away by the imagery, the music, the dances of the chorus and the perfect delivery of Euripides' newly translated tragedy. 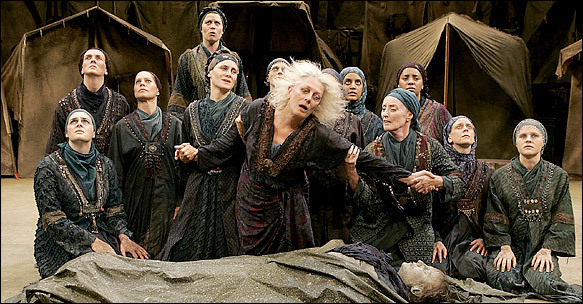 Vanessa Redgrave's performance, nonetheless, though technically irreproachable, lacks the emotion and pathos demanded by one of Euripides' most moving roles. True, Redgrave's imposing personality dominates the stage from her first appearance until her final exit, and the inflections of her low-pitch voice must be deservedly applauded and admired by the most demanding spectators, but her interpretation is analytical rather than emotional. Redgrave enacts a defeated Hecuba who lacks strength in the climatic moments of the play, those very moments that so many other actors and actresses in the role have previously fulfilled with anguish, despair and tears. We might still pity her, indeed, for Vanessa masterly displays the symptoms of a clinically depressed woman. But for that very reason our compassion becomes optional, rather than spontaneous, akin to the pity that good psychiatrists might feel for their most incurable patients. The main actor’s quiet performance contrast with the vivid interpretations of other RSC actors. The grief of Polymestor is not less moving than Hecuba's maid's before Polydorus' corpse.